KEW ENGG. & MFG. PVT. LTD. 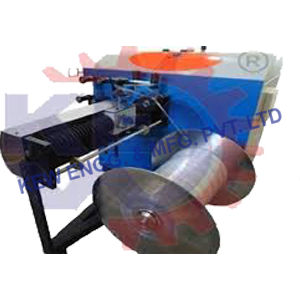 Trim Rewinder incorporate many features for high reliability of trim winding. The precision electromechanical traversing system is maintenance free with operator control of the traversing rate which remains constant regardless of the line speed or the spool diameter. This, together with the inbuilt pineapple winding technology, ensures optimum winding of the trim and therefore increases the reliability. The lightweight web guide roll assembly traverses for high-speed operation with the spool running in a fixed position. The motion control drive is controlled by a digital inverter drive, capable of both driving and stopping the motor. The material is fed by a dancer for tension control, equipped with a position feedback through the ultrasonic sensor. Together with the PID controls on the trim winder control board, this provides a speed reference for the motion control drive. The system operates to maintain the dancer in a fixed position, thus providing static rewinding tension. Pull roll for constant pull during roll change. Winding of 2 trims on one winder. Winded roll use for making rope.